If you have ever been to Acadia, Yellowstone or some other national park, then you have been to a geographic area that has been placed under protection for an ecological or cultural reason. Marine Protected Areas (MPAs) are similar to our national parks but are located in the ocean. Marine protected areas or MPAs are areas of the ocean where some or all human activities have been restricted for the purpose of nature conservation. (MPA Advisory Committee). Some of these locations are closed to all activities, but many allow recreational activities and others allow fishing. Of the 70% of our planet that is ocean, only 1% of world’s oceans are closed to all fishing, where as 12% of the land around the world is protected as a national park, world heritage site, monument, etc. MPAs occur in the open ocean, coastal areas, intertidal zone, and estuaries, and can include both terrestrial habitat located near the ocean, and areas of the ocean itself. 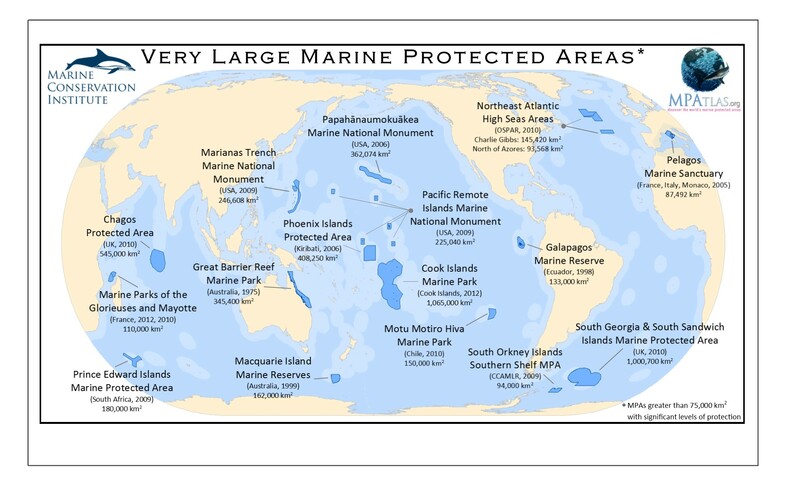 The image below highlights the largest marine protected areas in the world.